Terry O’Connell has left Dublin before, but he and his wife, Cindy, always seem to find their way home. O’Connell hails from Simsbury, Connecticut, and became acquainted with Ohio when he attended Xavier University. After graduation, he moved to Cindy’s hometown of Cincinnati. Then, when O’Connell was recruited by Spectrum, then Warner Communications, he and Cindy would unexpectedly find their lifelong home in Dublin. O’Connell, who is now retired, remained with Spectrum for 30 years. During those three decades, the O’Connells moved three times from Dublin to Boston and southern Connecticut. Despite being closer to O’Connell’s hometown, the couple knew they wanted to make their way back to Dublin – permanently. In fact, after moving back to Dublin for the third time, O’Connell, now an executive vice president for Spectrum, talked executives into allowing regional executives to move to the area for which they were responsible. A major reorganization, all to be able to stay in Dublin. The 31st annual Dublin Irish Festival takes over on Aug. 3-5. To check out the full line-up of performers and musicians, and to preview vendors, visit www.dublinirishfestival.org. As an executive with Spectrum, a major Dublin Irish Festival sponsor, O’Connell was appointed the Irish Festival’s second-ever honorary chair in 1998. Though his position with Spectrum was important, his dedicated work in Dublin and his love for both the city and Irish Festival made him perfect for the position. And it didn’t hurt to have a last name like his, either. It’s no surprise to O’Connell that, more than 30 years after its inaugural year, the Dublin Irish Festival has become the largest three-day Irish festival on the planet. Still, he’s blown away by the amount of work put in year after year by city officials, festival affiliates and volunteers, as he and Cindy return every August to volunteer and enjoy the festival. Cindy and O’Connell can be found every year at the opening ceremony, and volunteer in the Emerald Club. 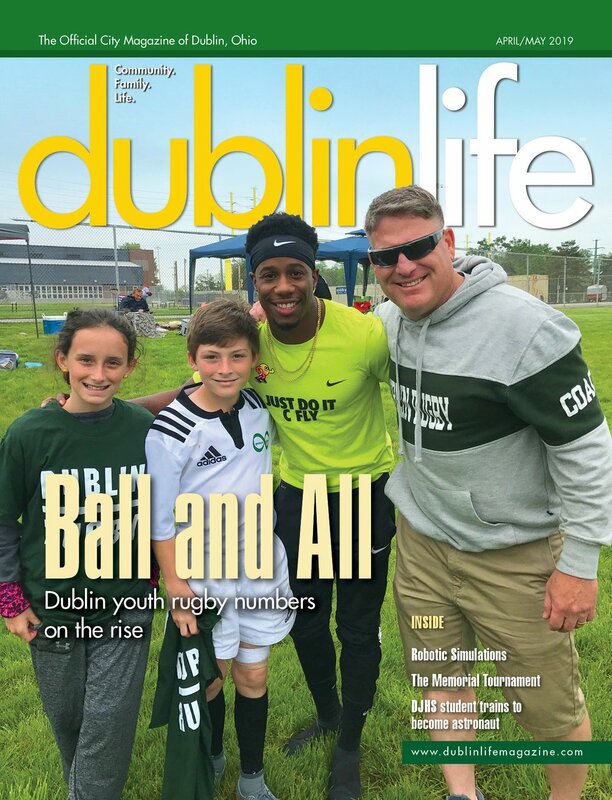 Now that O’Connell has seen it from both sides – first, as a corporate sponsor and now, as a volunteer – he is wholly appreciative of the effort. About 20 percent of DIF guests are Dublin residents and another 60 percent come from other Ohio cities. The remaining 20 percent of visitors come from outside of Ohio and all over the world. It’s estimated that the Irish Festival has an economic impact of more than $8.3 million on the local economy.With around 1,200 volunteers at the Irish Festival donating more than 10,000 hours to the event, you can be sure that every detail is perfect. Of those 1,200 volunteers, 130 are involved throughout the year as part of the planning committee. For the O’Connells, it’s hard to pinpoint just one thing that makes them want to stay. With two of their three adult children in the area, the rapid expansion of Bridge Park, and their vast network of friends and family, no other place on earth would truly feel like home. Though the O’Connells had to experience the heartbreak of moving out of Dublin not once, not twice, but three times, they promise that this is the forever home. After reforming a piece of how Spectrum operates just to continue living in Dublin, the couple is here to stay.